Where PlanB Tour viewers are. The redder the country, the more views; the paler, fewer views. We are back home in Portland, Oregon. We’ve decided to return to Plan A for awhile, so this will be our last blog post for Plan B Tour (v1). We decided to write this blog for friends and family. Given the wonders of technology, we’ve learned that more people are reading this than we know personally. This is what we found out about you as a group. 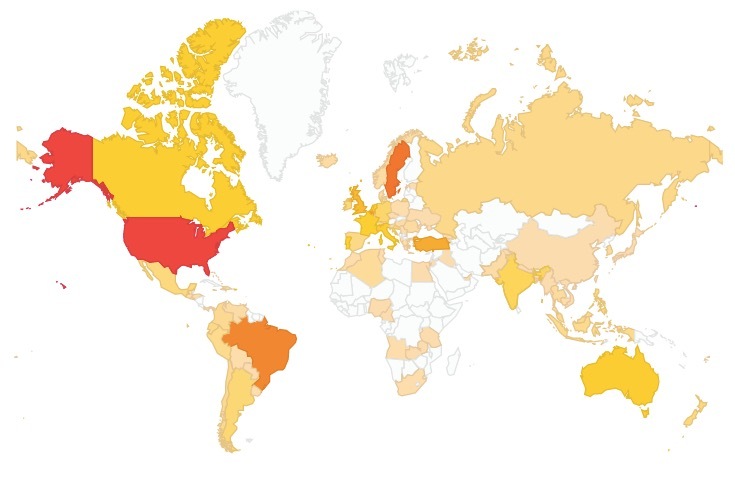 As of today, (April 28, 2015) there have been 8,920 views from 96 countries! For those of you who don’t know us personally, here’s a little bit more. Jim is a retired firefighter. He has a daughter, son, and four grandkids. He also spends time doing construction projects and volunteer work. 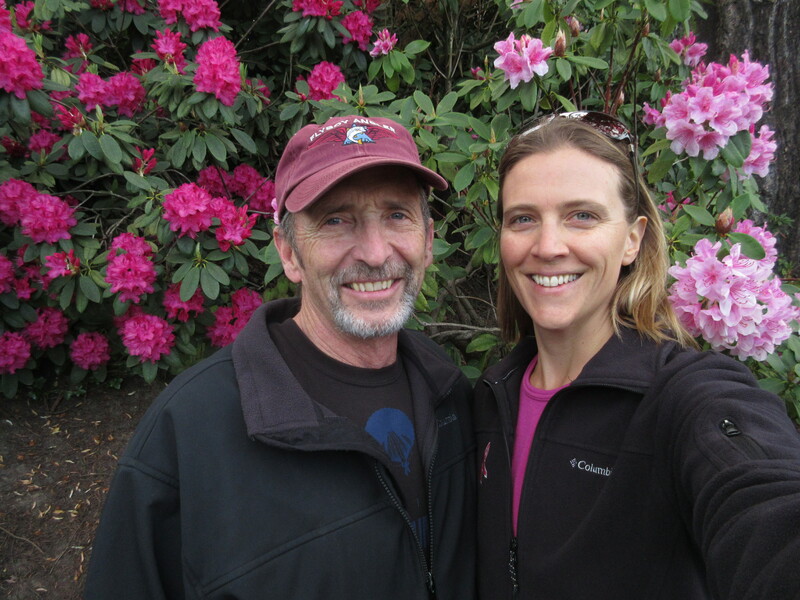 Megan works in higher education and will be pausing her retirement training as soon as she finds a job. In this year, she has perfected the recipes for key lime pie, granola, and oatmeal raisin cookies. She is looking forward to singing again with her local choir. Both of us are active, spending time outdoors and practicing conditioning. In case you didn’t notice from our previous posts, we love to eat, walk, people watch, swim and read. Our family and friends live here. It is a green city with many parks. The food is fantastic whether you are looking at restaurants, markets, food carts, or grocery stores. Getting around is easy. The city is walkable, drivers are courteous to a fault, and public transit is extensive. 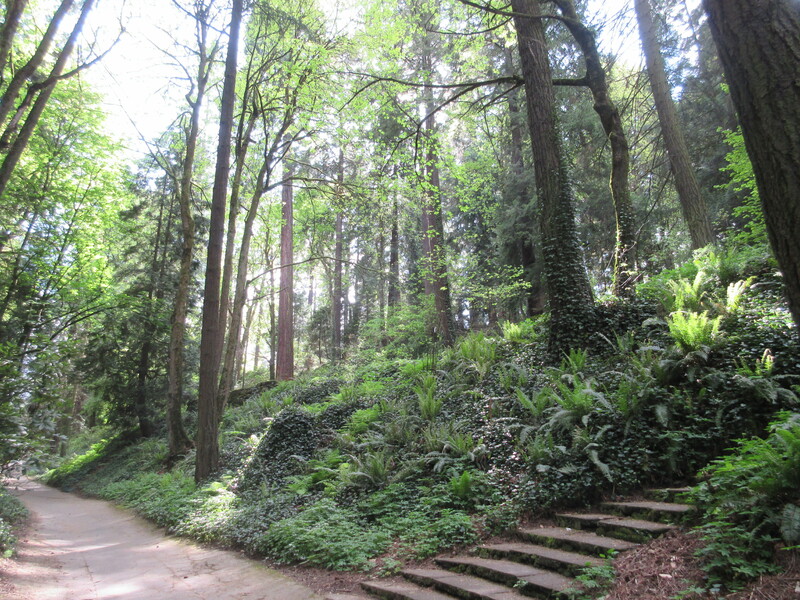 Easy access to natural playgrounds such as the Cascade Mountains, the Oregon Coast, and the Columbia Gorge. Presence of art and entertainment. A block from where we live. There are 70+ miles of trails right outside our back door. Thank you for following along with us. If you want to get in touch, submit a comment to the blog and it will pop up in our email. We wrote this story a few months ago for the kids in our family. It was so much fun that we now want to share it with the rest of you. Scroll down to keep reading about our fateful trip to Gambetta. 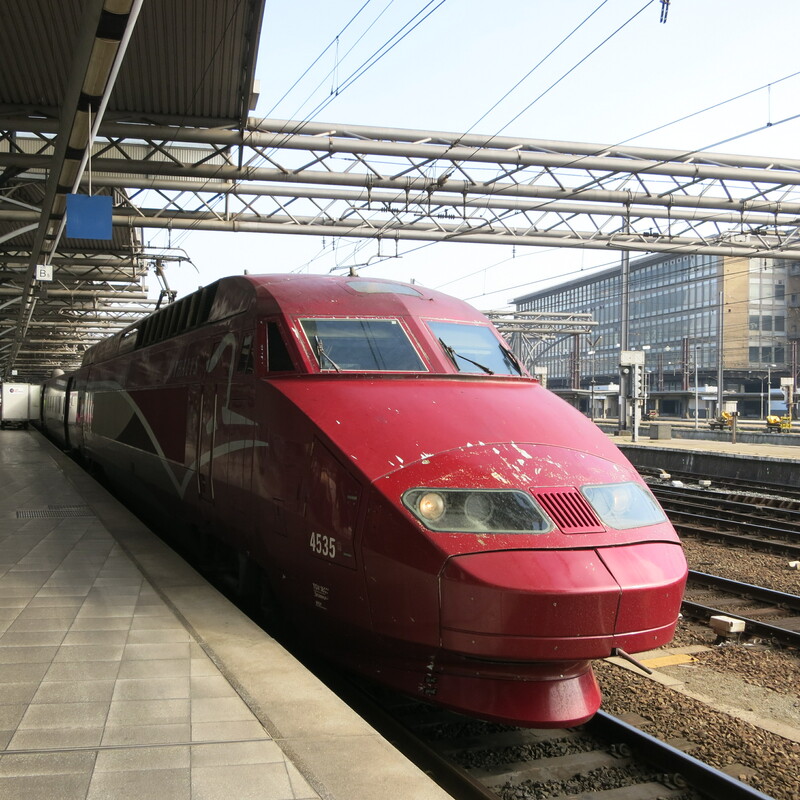 Our train from Paris to Northern Italy. 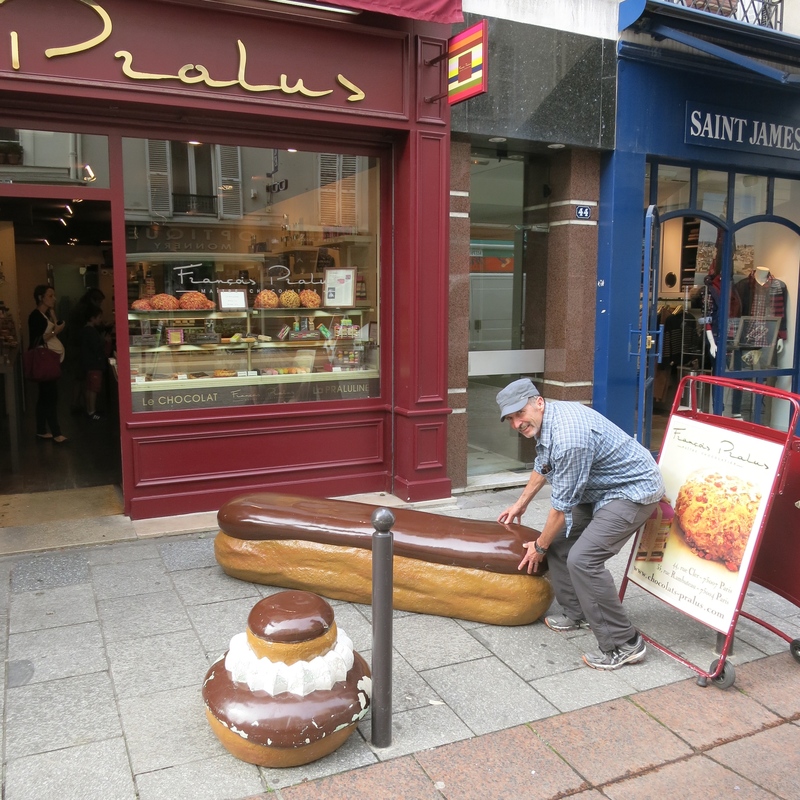 Halfway through our one-month stay in Paris we got a call from Jim’s friend in Italy. Anton asked if we could give him a hand moving his parents from their large family home to a small apartment closer to him. We agreed. We had cut Italy from our travel plans due to budget. With Anton providing train tickets and housing for us, we jumped at the chance to go affordably. Anton works in the restaurant business so we also knew the food would be the best. We packed lightly; in just a few days we would be back in Paris. We picked up our tickets at the station for the overnight trip to Italy. We were amused that Anton had secured first-class seats for us. Our train wound its way south and east through France as the sun set. We had a home-made picnic dinner of bread, cheese, and vegetables topped off with the last of Megan’s homemade apple cobbler. We took advantage of our first class full bathroom to wash up and then went to bed in our fully-reclined wide seats. Thank you, Anton! 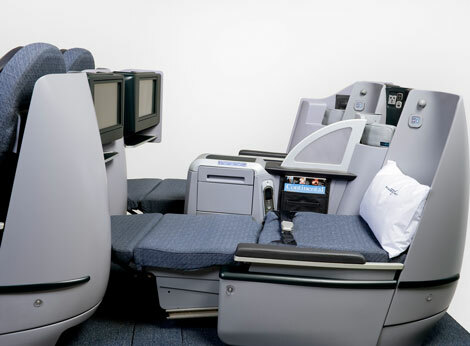 Deluxe first-class seats, folded into beds for the night. The train slowed as we began climbing into the French Alps. Around midnight we awoke. The train had stopped moving. No stops were scheduled until dawn so this was unexpected. Other passengers were beginning to stir. We went to look in the back of the car at a map showing our progress. We were in Gambetta. In our tour book, Gambetta was mentioned as a small independent municipality on the border. Neither of us had ever heard of Gambetta before. Lighted map in the train, indicating we were stopped at Gambetta. Where is Gambetta? 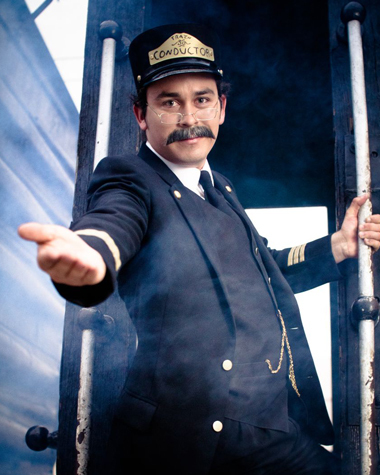 A conductor came through our car and made an announcement in French and again in Italian. He turned to leave the car. Perhaps noticing our perplexed look, he took pity on us and repeated the announcement in English. 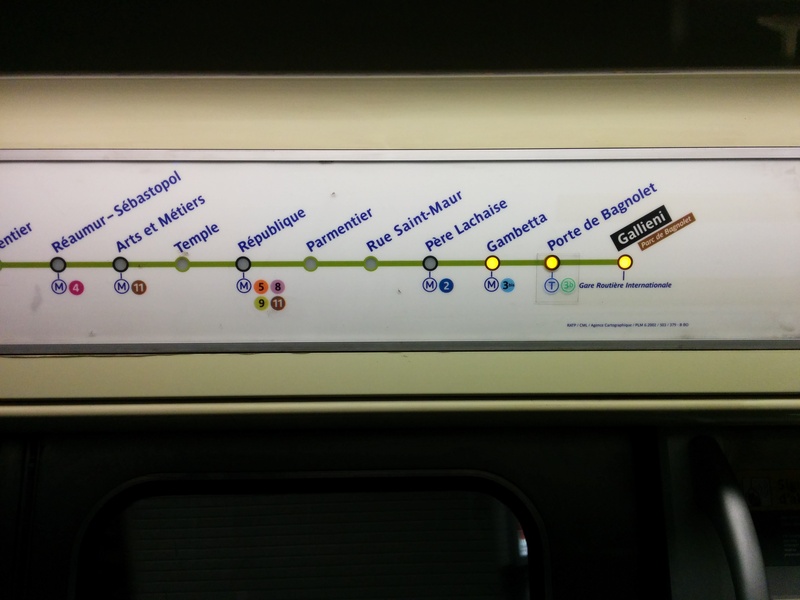 He said the train had been redirected to Gambetta by the government. All passengers were to bring passports and report to customs. He suggested we dress warmly for the cold mountain air on the unheated train siding. 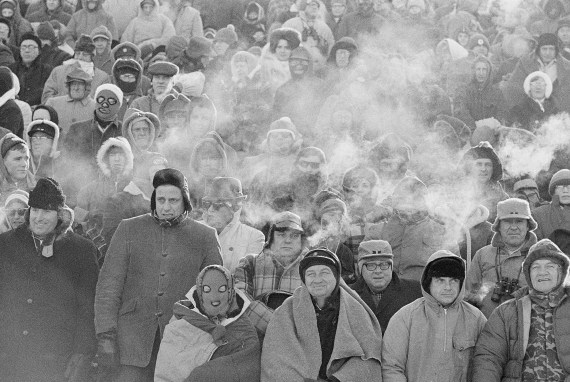 The crowd disembarking with frosty breath. We bundled up and and left the train in a crowd. Hung over the siding platform was a sign with a gigantic letter G in a coat of arms. Below the “G” the sign said, “Welcome to Gambetta, Land of Light and Dreams.” It was cold outside and our breath frosted into mist. Several hundred passengers disembarked with us and headed toward the station house. Our collective breath seemed to gather in a glittering fog. As we walked along, the concrete deck gave way to luminous glass panels. The light from the panels merged with the reflecting crystals of our breath and we seemed to pass through and over light. 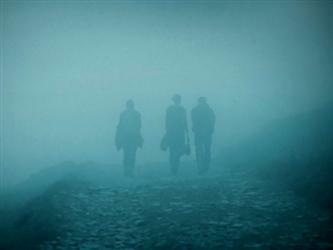 The other passengers disappearing into the brilliant fog. We walked into the station through three great arches forming a wall covered in mirrors. The effect was brighter than full sun, but diffuse, as if light was coming from everywhere. The other passengers moving with us appeared as shadows all exhaling puffs of frozen crystal breath. 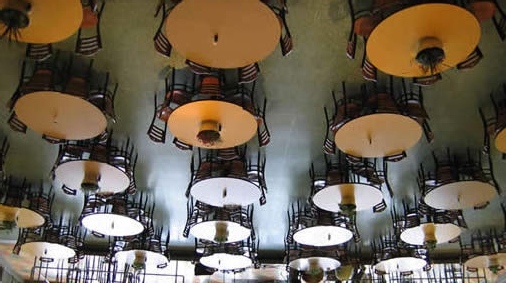 Tables and chairs, seemed below our feet in the mirrored floor. As we went through the arches, the floor turned into mirrors. The warmer air from the station caused the fog and its illumination to vanish. We could now see ourselves reflected in the mirrored floors. We noticed chairs and tables in the reflection below our feet. We felt strangely upside down. Looking up, the tables and chairs were actually suspended from the ceiling! This added to our feeling of being upside down. Ahead of us, a man in a uniform was waving. Was he waving us to his booth? Below in the mirror I could see hundreds of passengers walking. 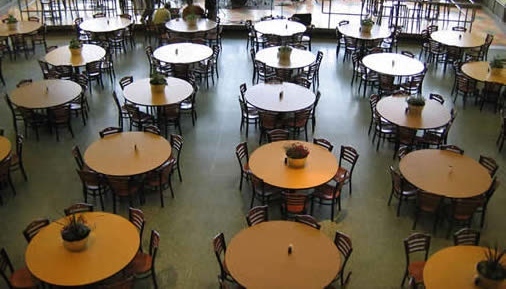 I looked up and saw the ceiling covered with tables and chairs. I stopped and looked back; the other passengers were gone. Gambetta customs agent offering us chocolates. Yum! The man in the uniform continued to wave us over. He ushered us into his booth and told us to sit. “Passports please!” he exclaimed. In return for documents, he offered us a plate of chocolates. 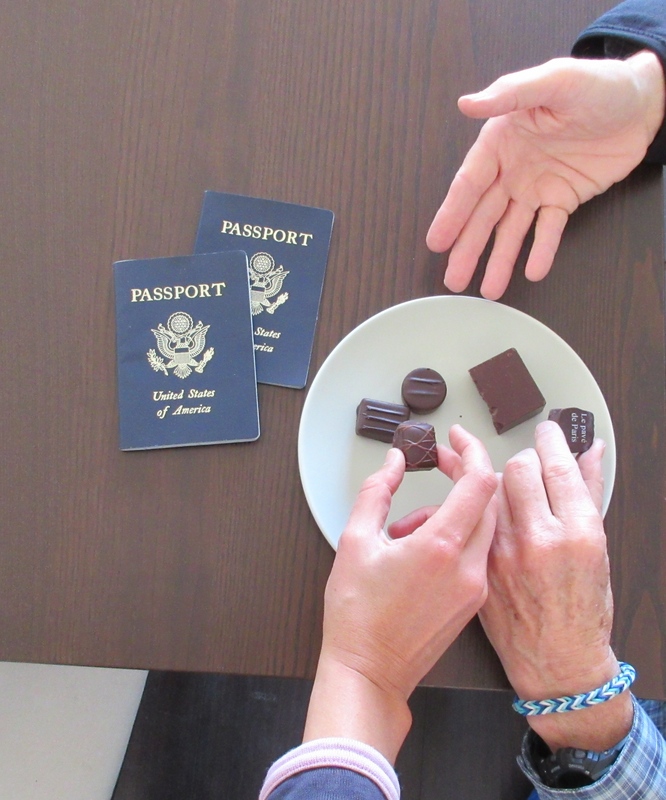 We tried to explain our situation but couldn’t with our mouths full of chocolate and bad accents. He waved a hand for silence and said, “Impossible!” Then he stamped our passports, issued each of us a napkin and ushered us out before we could say anything else. 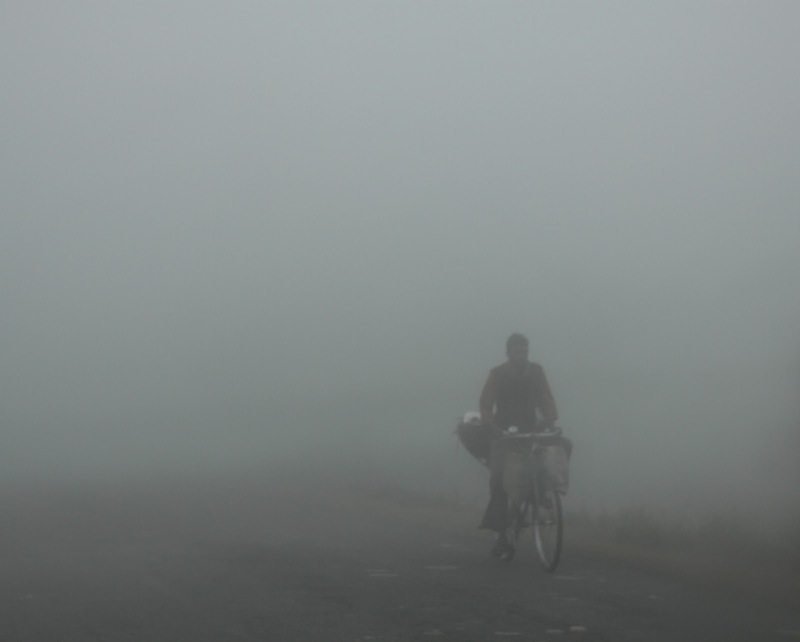 Custom agent cycling into the night fog. We walked to the front of the station. All of the ticket windows were closed. The arrival and departure boards were shuttered. We heard a door close behind us. Our customs agent, pushing a bicycle, locked his door and pedaled into the night ringing a bell as he passed us. To keep warm, we walked the rest of the night. Gambetta is a small town, I mean country. We passed most of the streets twice. One unseen dog barked at us. Dawn found us at the town hall reading community postings. There were signs for rooms to rent, jobs at bakeries, a notice for a yodeling concert, and eggs for sale. A fluttering noise caused us to turn around. At our feet was a pigeon. 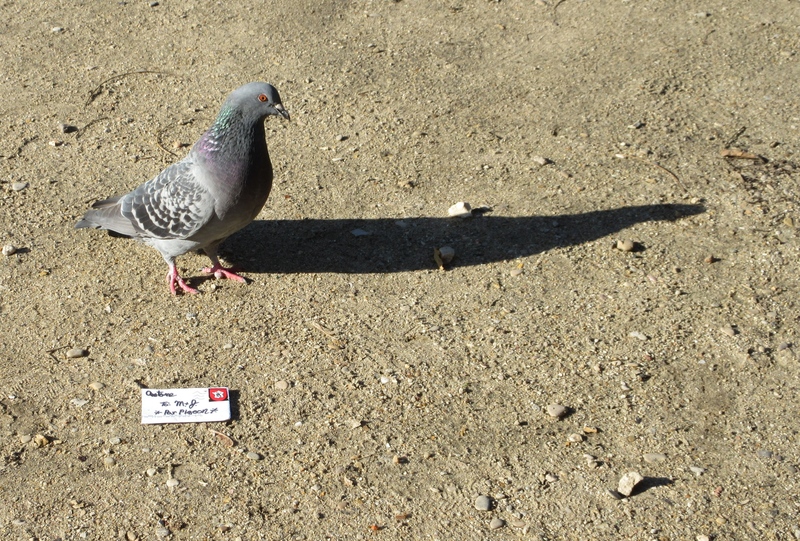 The bird dropped an envelope and waited expectantly, watching us with one eye. We offered pocket crumbs from sources unknown as payment. After a sidewalk meal, the bird flew off. The tiny envelope was addressed to “M+J.” The return address was simply, “Anton”. I carefully opened the envelope to find a single sheet of paper. Word has come to me that your train has become impassable in both directions. Such are the hazards of traveling in the mountains. I have taken care of my Mama and Papa, so do not worry about that. You must now continue your journey and return to Paris. Please be at the Gambetta North Gate at noon today. I am sending some small help for your safe return. 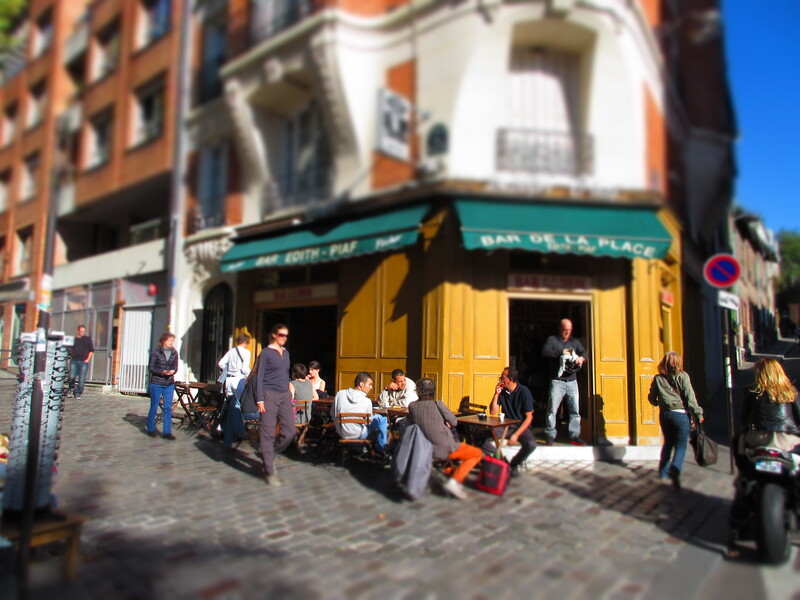 We spent the morning in the sun at the Edith Piaf cafe. We spent the morning at a cafe enjoying croissants, cafe creme, and tea. 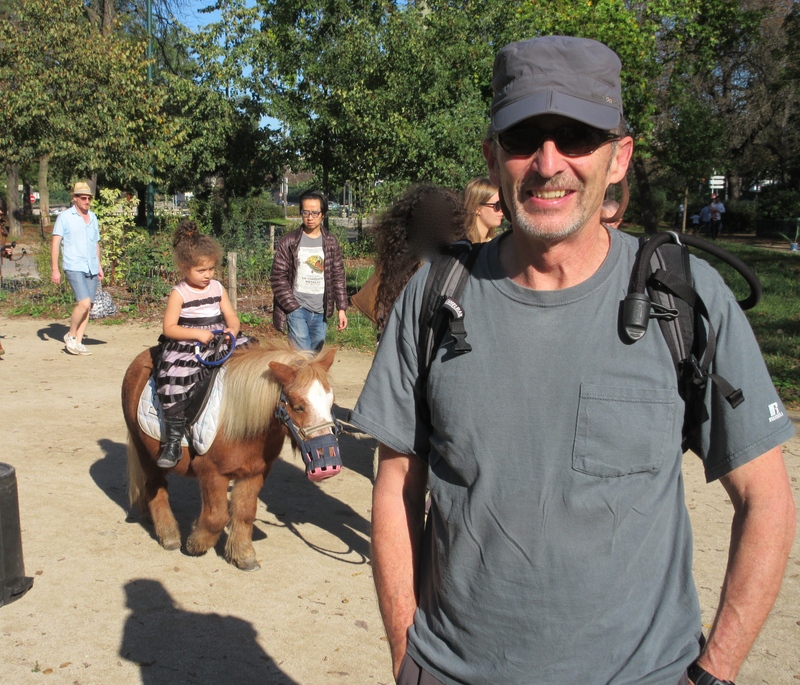 The “small help” that Anton sent turned out to be his niece, Adalie, on her stalwart pony. 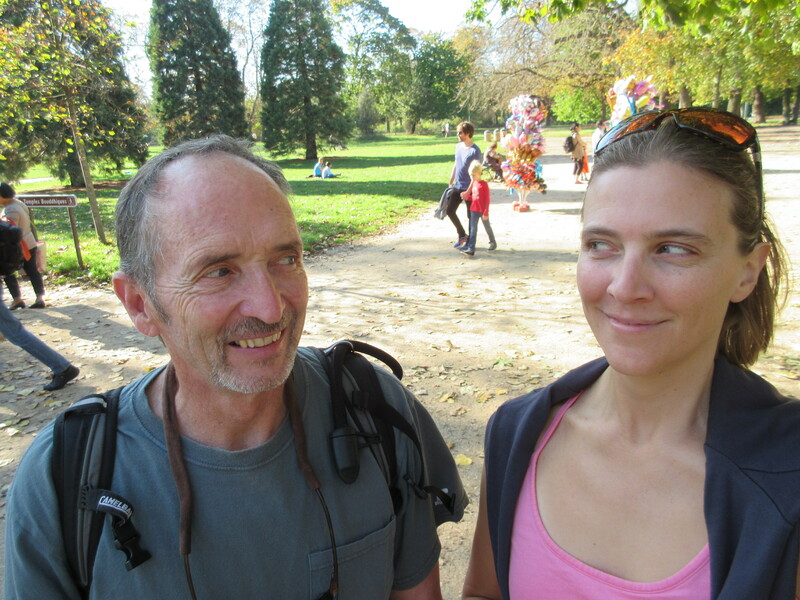 Under her guidance, we returned to Paris the next day and continued our journey as we left it. * (While none of the events described here have happened the authors do not consider this a piece of fiction. These events simply have not occurred yet). I often find myself looking up at the sky. Day and night, the show of textures and colors is ever present. Almost everyone likes a sunny day. Almost everyone has gazed at the stars and moon. 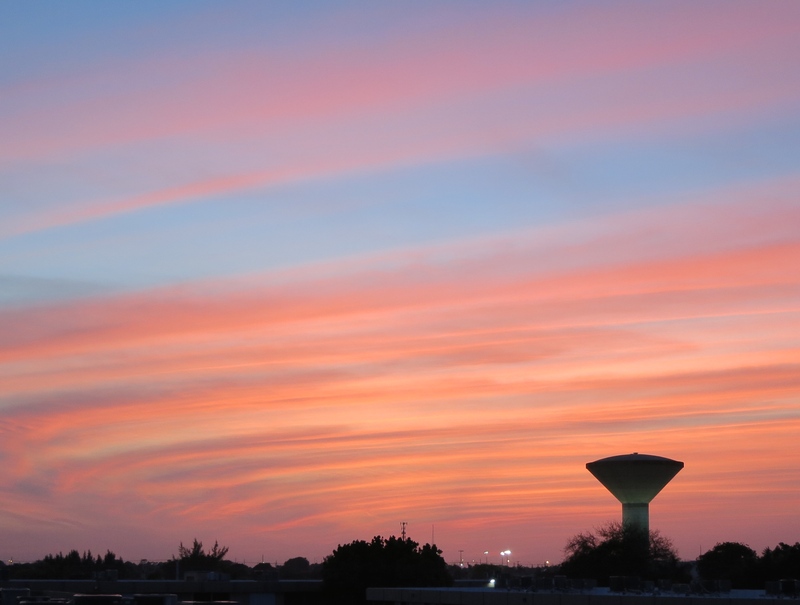 Sunsets and sunrises are renown for their displays. However, clouds are often underappreciated for their beauty and drama. In the last year, we’ve spent countless hours looking up. Only a few of our cloud pictures have appeared on Plan B Tour. Now is the time to pull back the curtain and show them all off. Clouds are whimsical, miraculous, and dynamic. As Gavin Pretor-Pinney says, they are also the most egalitarian of nature’s displays because we all can see the sky. Cloud gazing provides a way to slow down, to imagine, and to disconnect from the endless bustle. You can scroll through the cloud pictures below to do just that. If you are moved further, check out the Cloud Appreciation Society and this 10-minute TED talk by it’s founder, or turn off your electronics, head outside and take a look for yourself! Bear makes a pre-dawn snack of the moon. 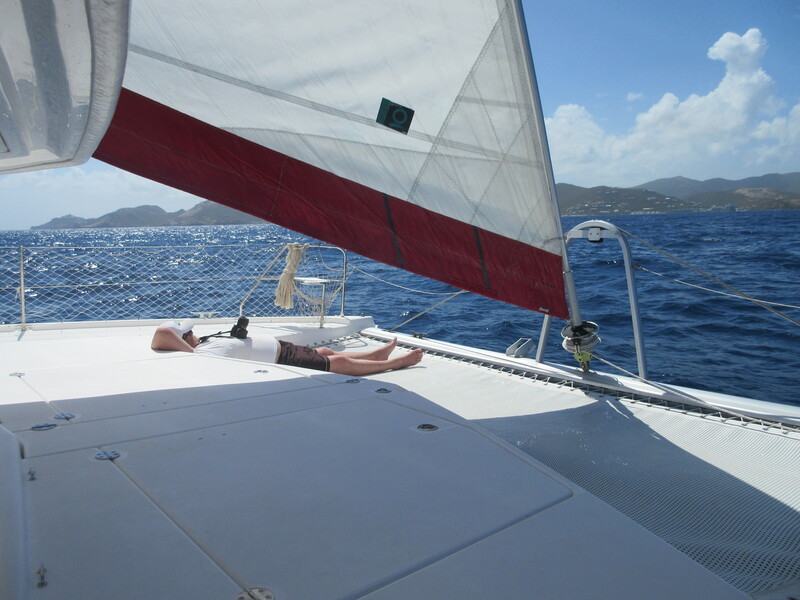 We recently got back from our last planned international adventure: a week-long sailboat charter beginning in Saint Martin. St.Martin, is 230 miles east of Puerto Rico and is a unique island because it is split between the Dutch and the French. It has the only airstrip in the smaller Caribbean islands that can support a jumbo jet. In fact, the beach is right at the end of the runway. Many tourists pose on the beach with a huge plane immediately overhead. You may have seen this sight on postcards, magazines or notorious YouTube uploads. (If you are looking for the next winners of the Darwin awards, a quick search will reveal some top contestants.) We did not visit that particular beach. 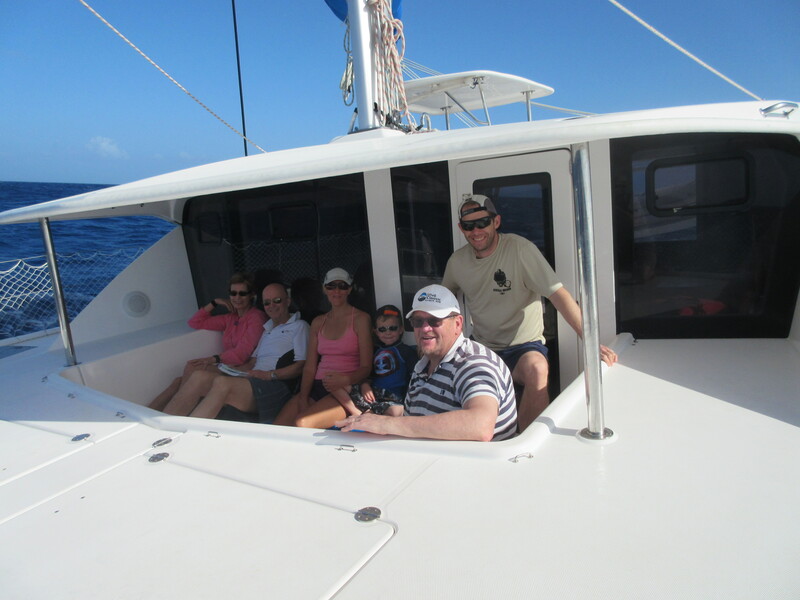 On board with us were our dear friends from Sweden, Sven and Eva, a good friend of their’s named Krister, Jim’s son Brian and 6-year-old grandson, Jackson. 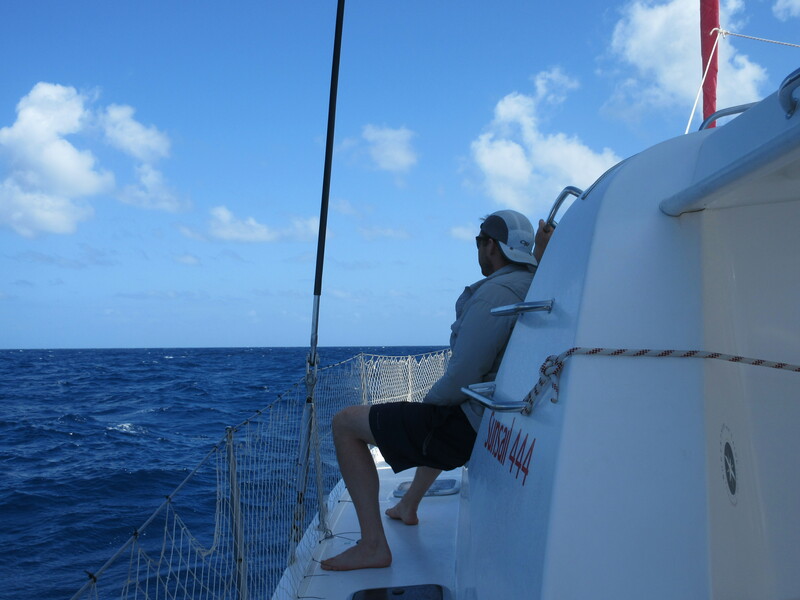 Almost every island in this part of the Caribbean is a different country, unlike our previous sailing trips, so we had the added complication of clearing immigration and customs several times. 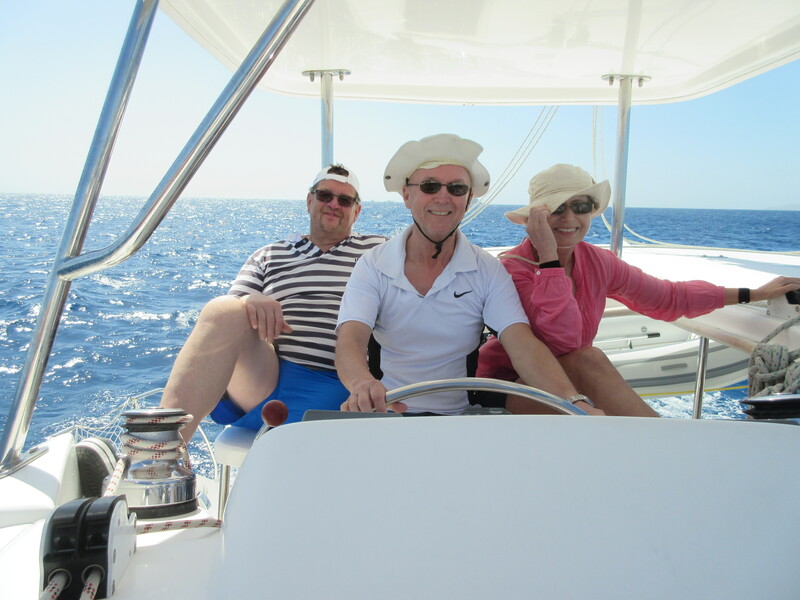 We visited Sint Eustatius (Statia) and Saint Barthélemy (St. Barth) and then returned to Saint Martin. St. Barth is known to cater to mega-yachts. Huge fancy power and sail boats were all around with large crews working the decks and garages in their hulls for jet skis and zodiacs. 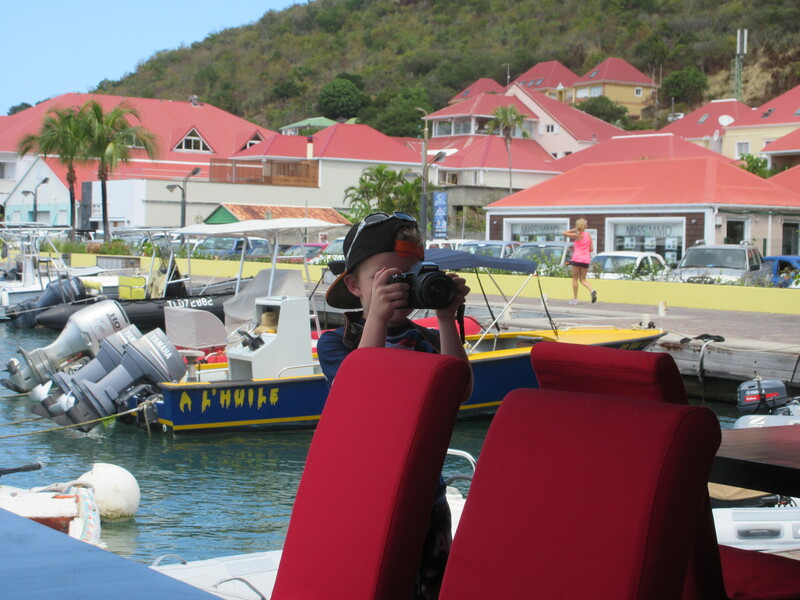 The port town of Gustavia is where today’s jet-set French go to see and be seen. Interestingly, especially for our Scandinavian friends, St. Barth was the only colony Sweden ever had. Gustavia is named after the Swedish King Gustav III and all the streets in town have both a French and a Swedish name. 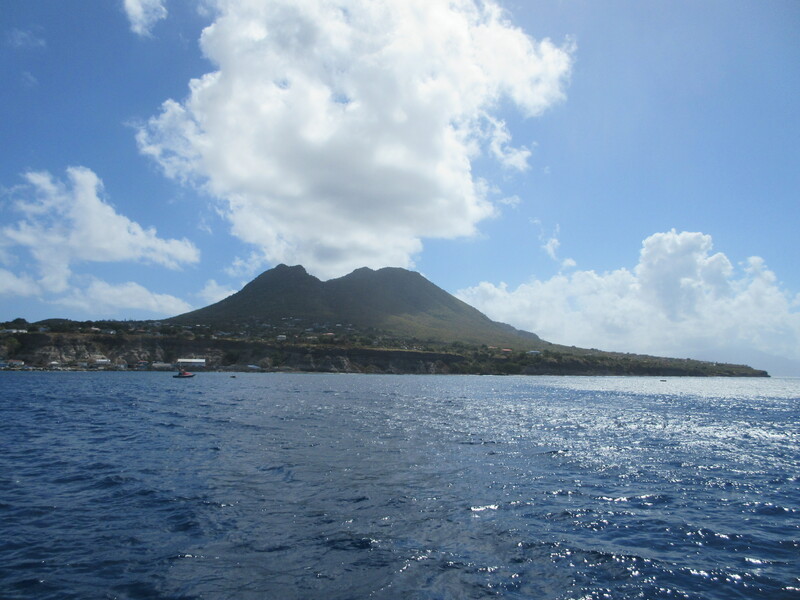 The jagged dormant volcano on Statia. 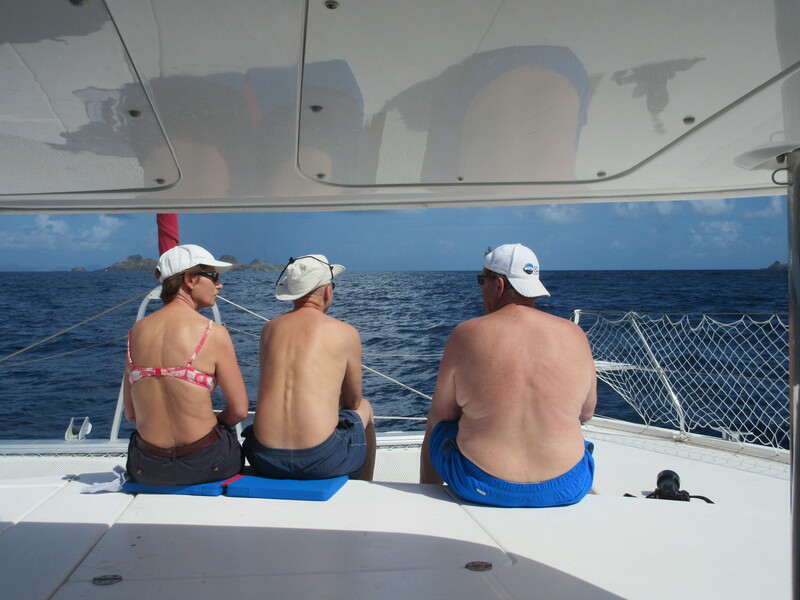 Unlike St. Barth, Statia is blue-collar, not frequented by tourists, and is a little rough around the edges. Historically, Statia was one of the busiest trade ports in the Caribbean and changed hands 22 times! In 1780, the British declared war on Holland and sent Admiral Rodney to claim Statia. The wealthy merchants and traders did not want to share their profit. 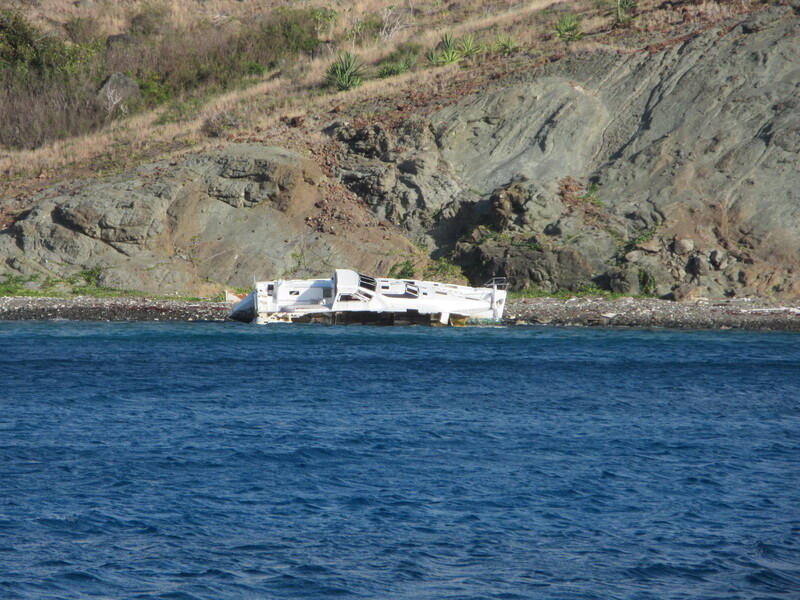 Our cruising guide said they held many “funerals” burying coffins full of gold until Rodney caught wind of the scam. After British occupation, the island never returned to it’s full glory. A series of storms ruined the sea wall and warehouses right at water’s edge. Today, the rubble acts like an artificial reef and is a good place to snorkel. 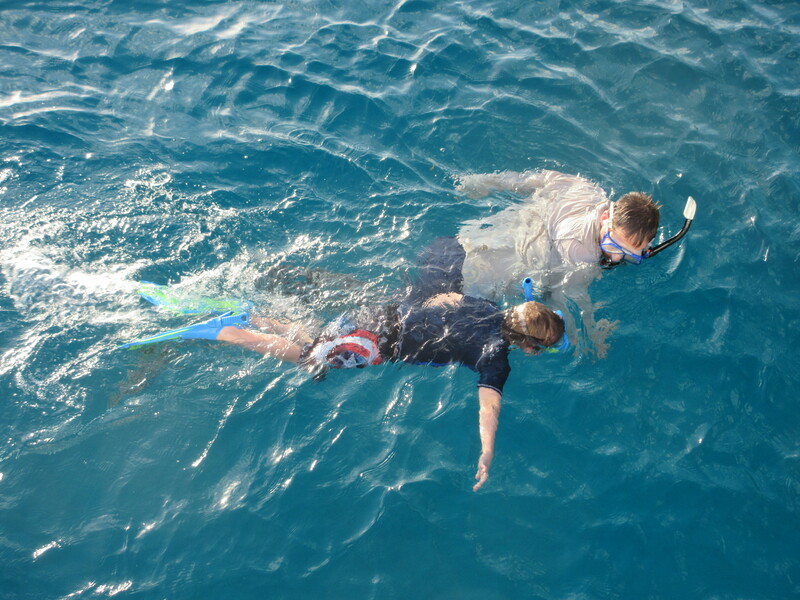 Snorkeling right off the boat. 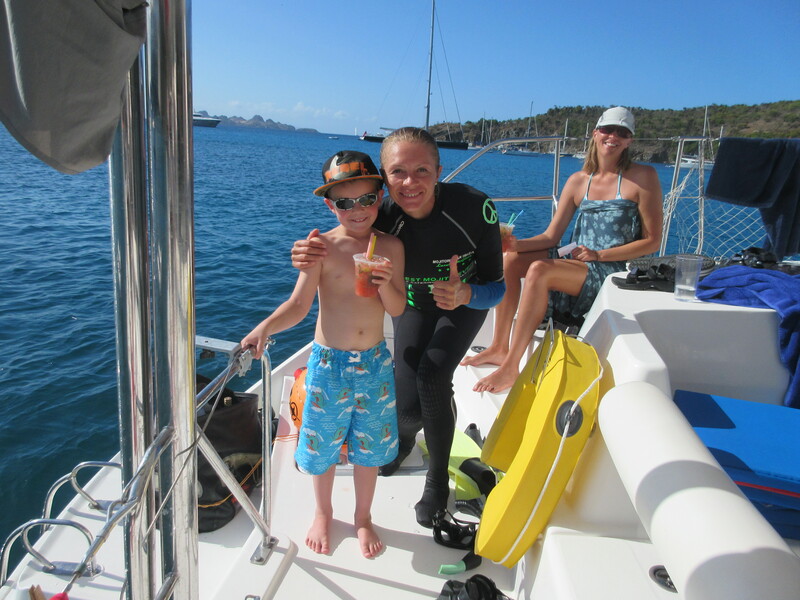 If you have been following us all along, you know that we love to snorkel. 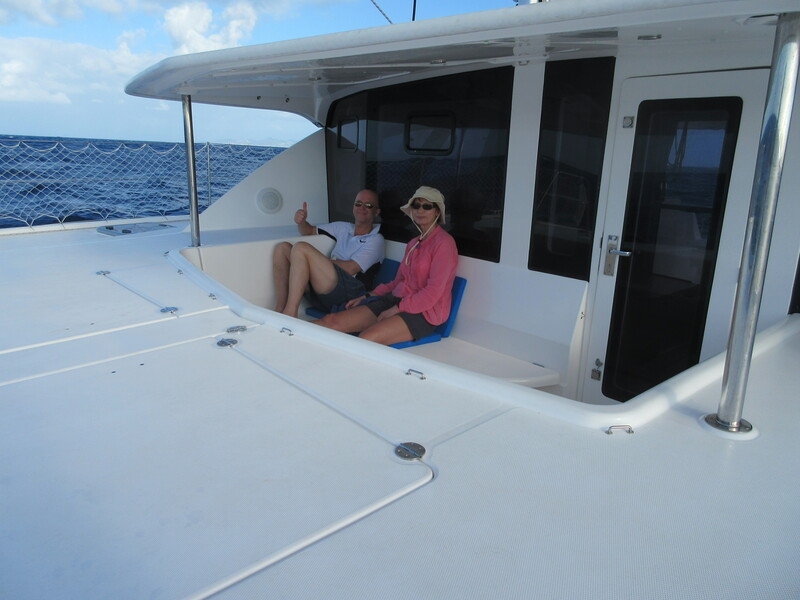 The things that made this trip special were the predominance of turtles, barracuda hanging out under our boat, many colorful starfish, in addition to the wide variety of coral and fish. 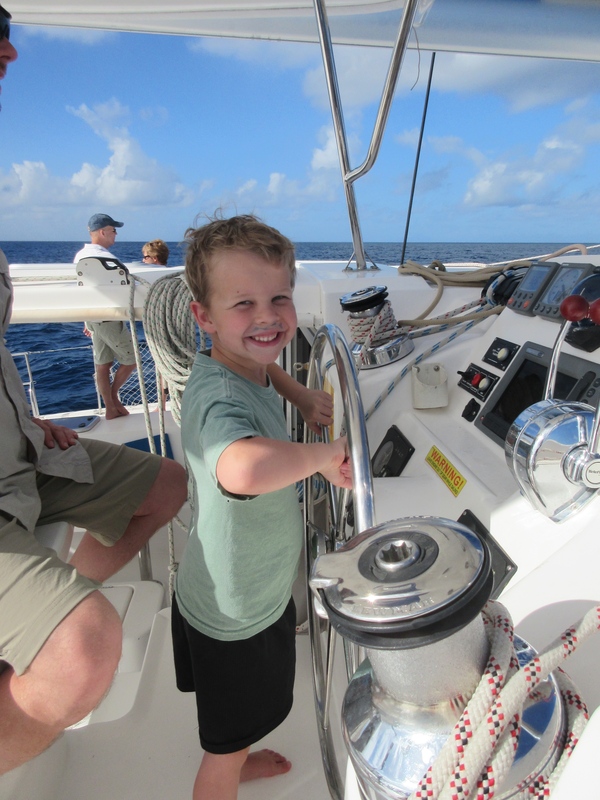 Jackson took to snorkeling in a big way, fearlessly exploring reefs and walls at every opportunity. 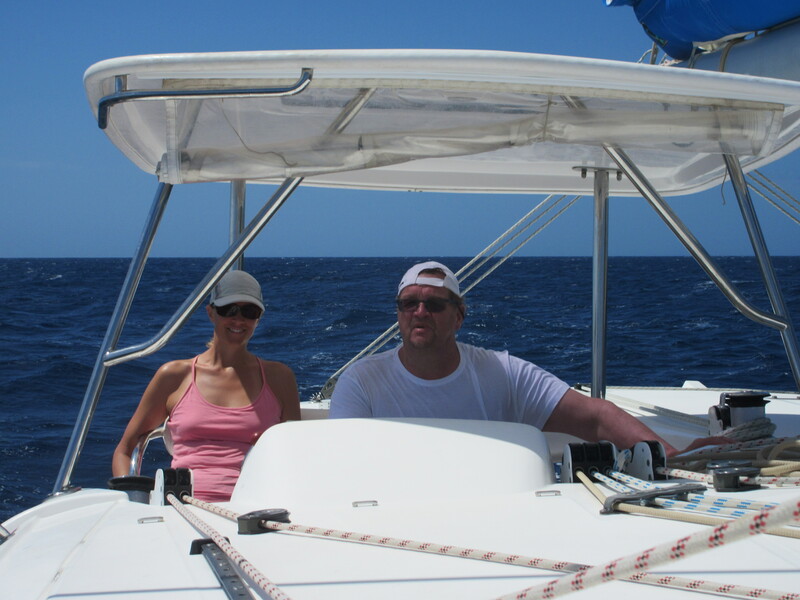 Going snorkeling with someone for the first time heightened our joy and enthusiasm for the wonder of all that is underwater. Mojito Woman setting up the bar. 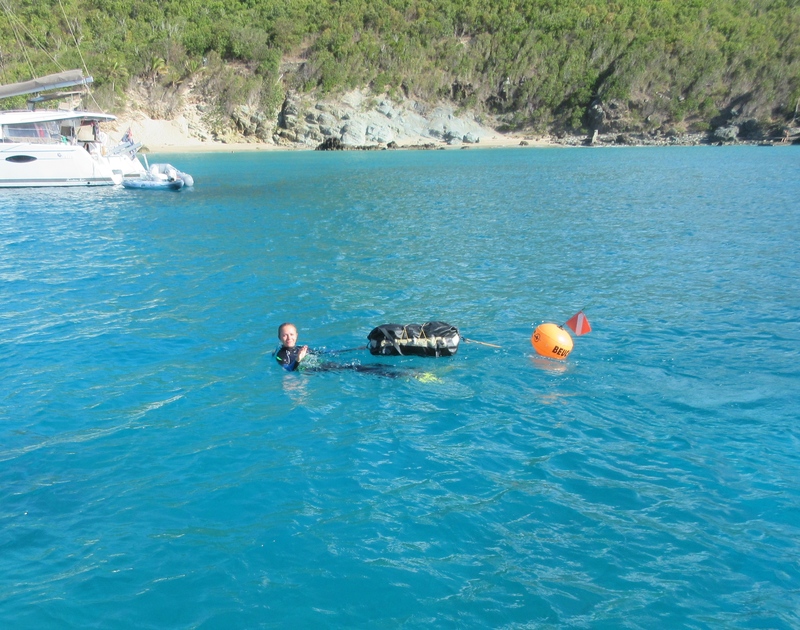 One afternoon while anchored off Anse de Colombier (Saint Barth), a woman came swimming by with a large dry bag and a dive float. When I waved, she asked if I wanted a mojito! 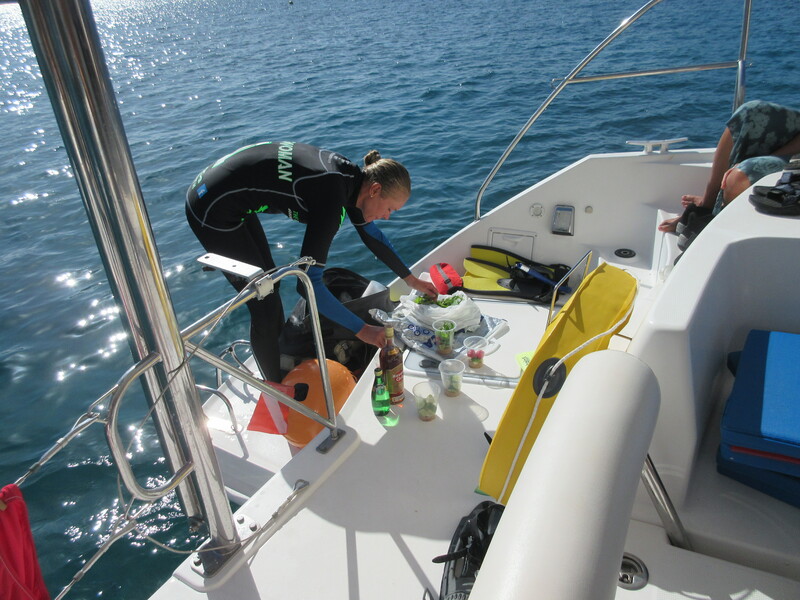 A minute later, she climbed up our swim ladder, hauled up her bag, and was taking orders. She and her husband are known as Mojito Woman and Mojito Man. They swim around busy harbors serving made-to-order mojitos. She closed the deal by offering non-alcoholic ones and a free one for Jackson. She pulled all the ingredients from her bag, including ice, fresh mint, fresh strawberries, lime wedges, and bottles of Perrier. They were delicious! Ten minutes later, she was back in the water and off to the next boat. Enjoying the view and shade. Aside from the unexpected mojitos, the other culinary delight we discovered was a new take on banana pancakes. The recipe is so tasty, easy, and healthy, you can find it below. Captain Jackson at the helm. 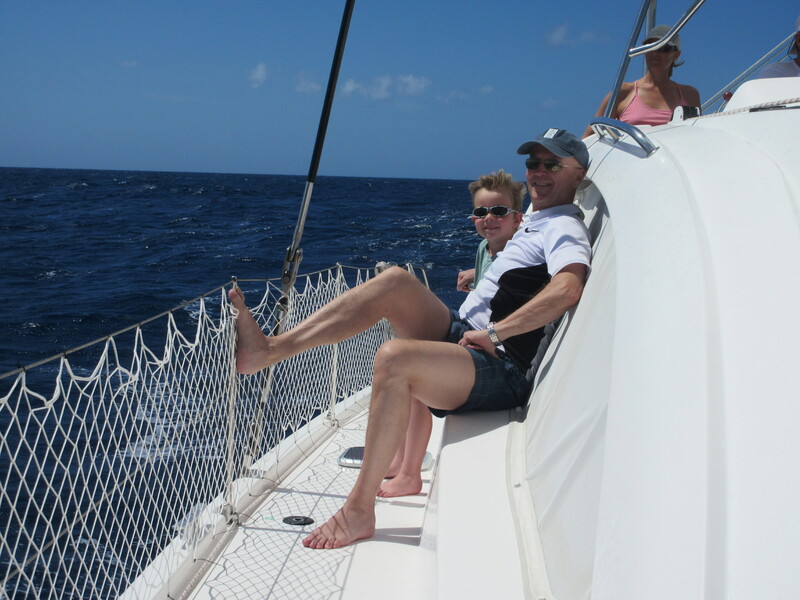 As always, you can see more pictures from our trip by looking at the full gallery here or keep scrolling down and you can view the map here to brush up on your Caribbean geography. 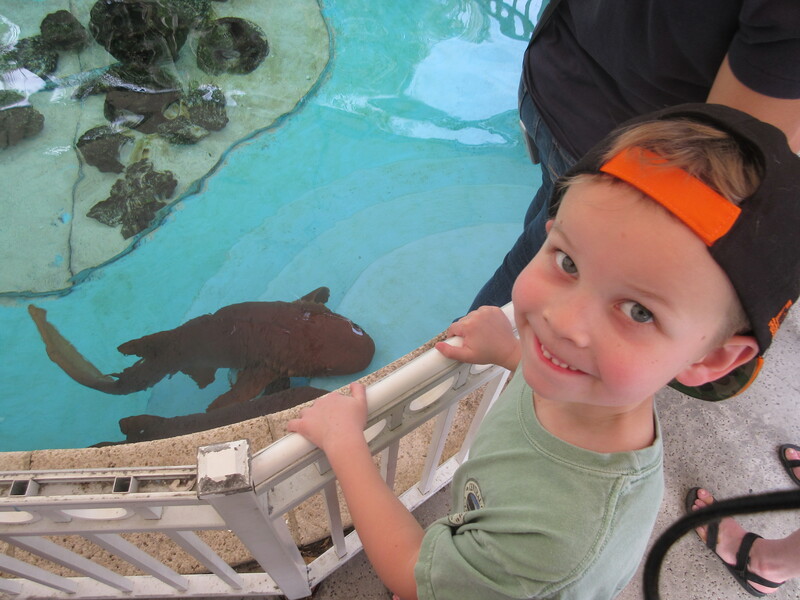 Jackson and some nurse sharks at a nature center. We saw three wrecked catamarans washed ashore. A reminder of the annual hurricane season. Sven and Eva in the forward lounge. 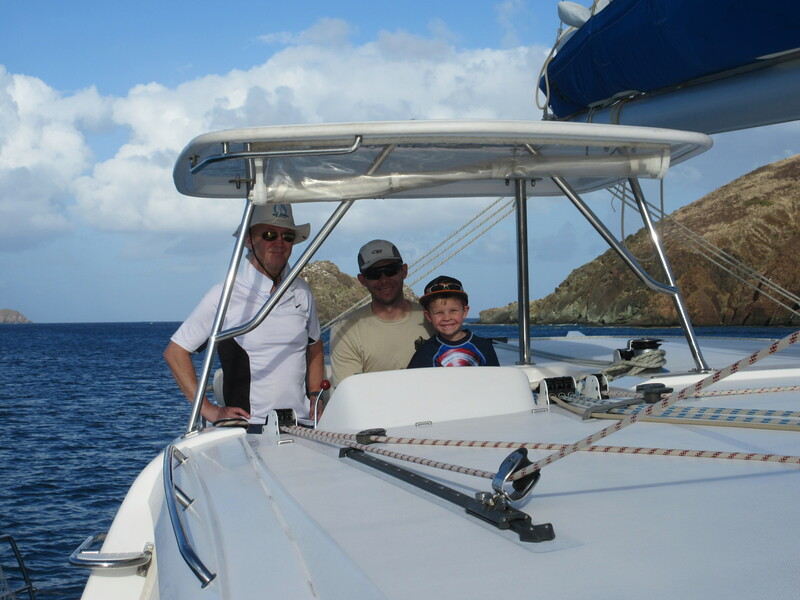 Jackson and Brian take the helm. 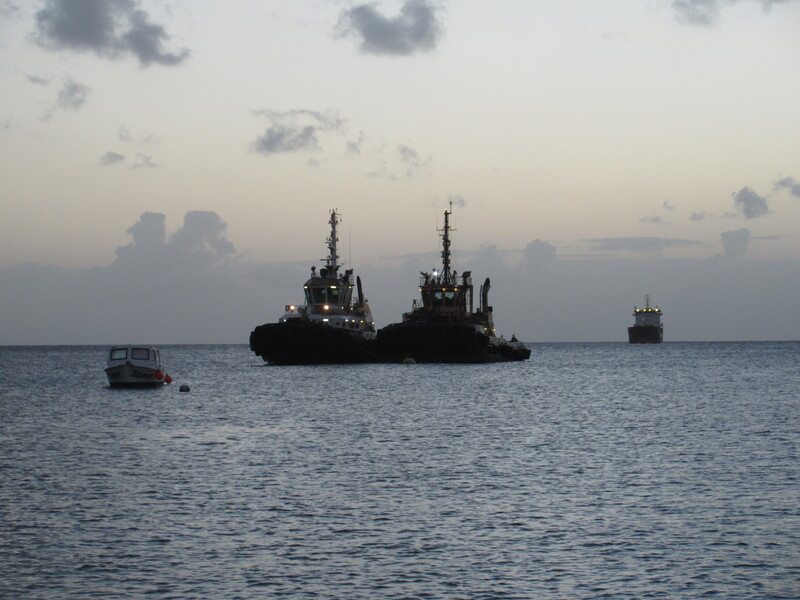 The waters around Statia are busy from a crude oil transfer station. These tugs fired up and went to work at night, near where we were moored. Jackson and Sven enjoying the sun, wind, and view. Megan and Krister. 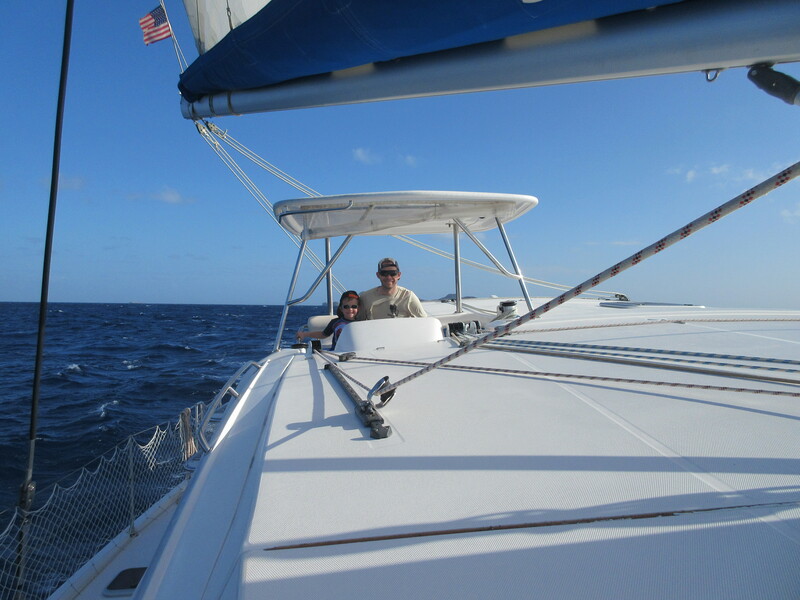 We alternated days at the helm. One afternoon Jackson borrowed our camera to take pictures of what caught his attention. 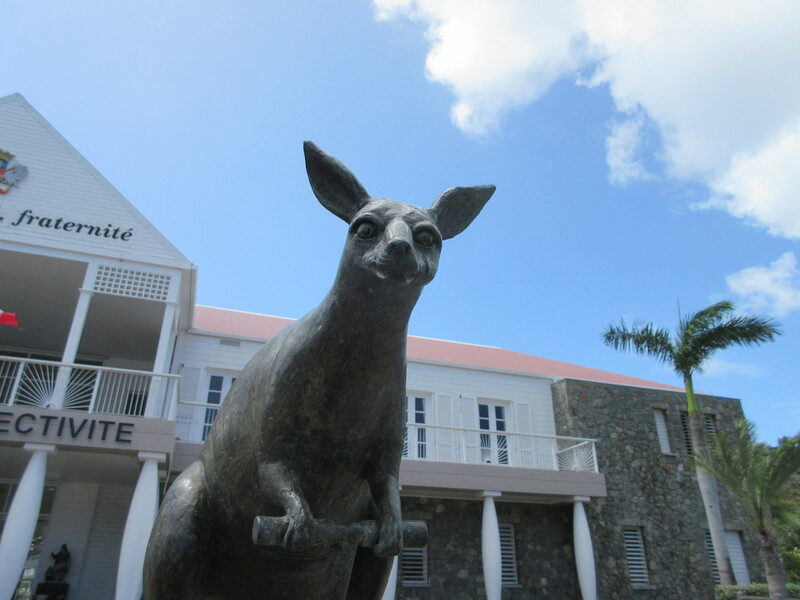 This bronze sculpture in Gustavia is looking right at him. On a photo shoot with Jackson in Gustavia. 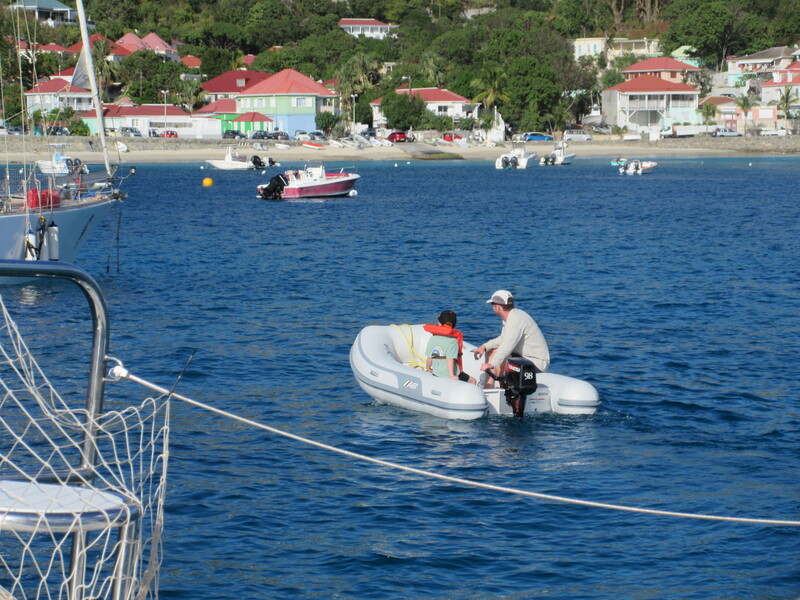 Jackson and Brian exploring from the dingy. Gustavia, St. Barth. 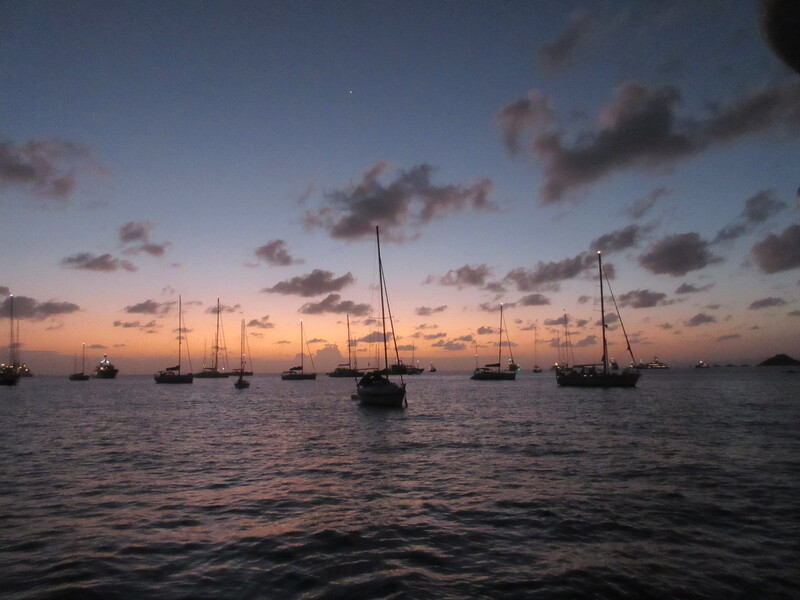 Sun setting over our night anchorage in Gustavia. Mojito Woman in search of the next customer. Mojito Woman earned Jackson’s endorsement. 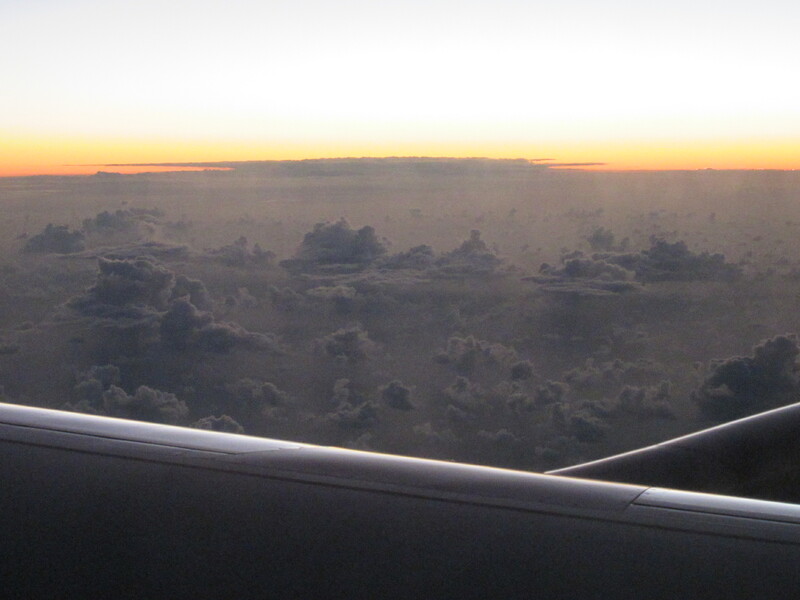 Fantastic cloud castles seen on the flight home.